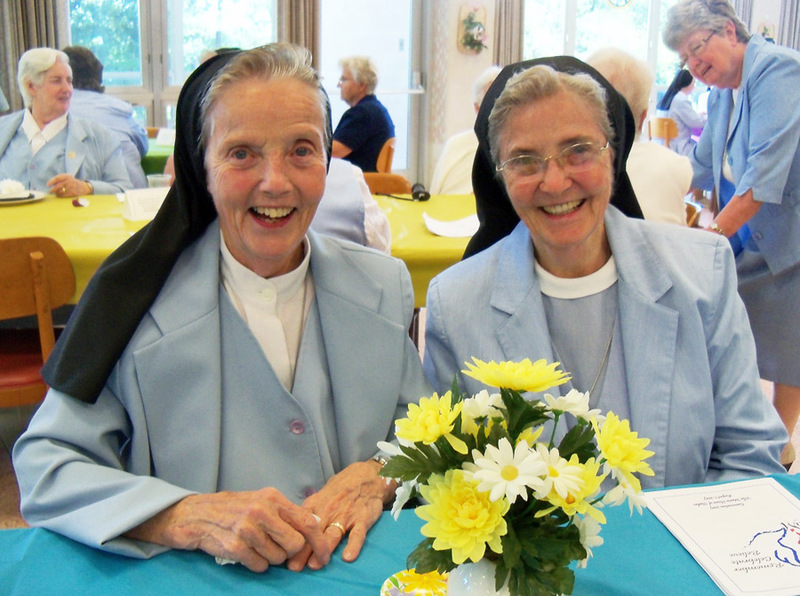 Sister Regina Christine O'Brien (left) and Sister Regina Anita O'Brien, birth sisters from Villanova, entered the Sisters, Servants of the Immaculate Heart of Mary congregation together in 1954. Above, the sisters spend time together with other I.H.M. sisters at Immaculata. Women religious are usually called “Sister” for good reason. When they enter a congregation they leave their family of birth and enter a spiritual family. The members of the congregation become their new spiritual sisters in religion and their superior becomes their spiritual mother. Sister Regina Christine O’Brien, I.H.M., and Sister Regina Anita O’Brien, I.H.M., who attended the Jubilarian Mass at the Cathedral Basilica of SS. Peter and Paul on Sept. 24, are not only spiritual sisters they are blood sisters. To carry that one step further, they are also fraternal twins, but in a unique way. Sister Regina Christine, whose birth name was Mary O’Brien, was born May 25, 1936 near midnight. Sister Regina Anita, whose birth name was Anne O’Brien, after her mother, was born a few hours later on May 26. The second and third among six children of Anna and James O’Brien, they were raised initially in St. Thomas of Villanova Parish where the Sisters of Mercy who taught them had a profound effect on them, Sister Regina Anita remembers. This was especially so when they were 9 years old and their brother, Jimmy, two years older, died from cancer. 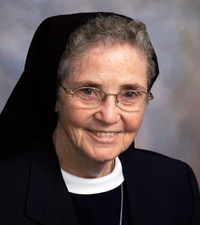 Sister Regina Christine O’Brien, I.H.M. Not long after that their father built a home in Newtown Square, where their teachers were Immaculate Heart Sisters, both at St. Anastasia School and the former St. Agnes High School in West Chester. The latter was ahead of its time for Catholic high schools in the Philadelphia Archdiocese as it was coed. The O’Brien sisters had a full social life and participated in all the ordinary teen activities including dating. Both girls were considering nursing as a career. When Anne made the decision that God was calling her to enter religious life, Mary was surprised, and prayed that her sister was doing the right thing. Through prayer she realized not only that her sister had made the right choice, but God was calling her also. They entered together in 1954 at age 18 just out of high school and have never looked back. That both have names in religion beginning with Regina for Mary Queen of Heaven is not a coincidence. Most of their class of about 65 who entered that year were given Regina, also especially because it was a Marian year in the church. After formation the two sisters were assigned as first grade teachers to the same school, St. Cyril in Lansdowne. Sister Regina Christine had 87 children in her class while Sister Regina Anita had 85. A seasoned sister taught a third first grade and was a great help with counsel and support as were the other nuns. It was a wonderful assignment for them. After that their assignments diverged. Among other places Sister Regina Christine spent years missioned to Chile and Peru as well as local parishes. Now well past the age when most people retire, she teaches religious education in the Hispanic Catholic community in St. Laurence, Upper Darby. 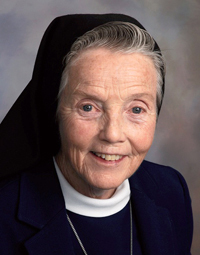 Sister Regina Anita O’Brien, I.H.M. Sister Regina Anita taught or was principal at a number of schools over the years, and a parish director of religious education. She is now a pastoral minister for retired sisters in Immaculata. Somehow, one feels God knew exactly what he was doing when he called Mary and Anne O’Brien and all of the other dedicated women and men at the Jubilarian Mass to religious life. That’s a beautiful story! I remember Sr. Regina Christine from Saint James in Falls Church, VA. She was my second grade teacher and my favorite teacher at that school. It’s so wonderful to know her story and to see how she is doing! Beautiful story! I taught at Immaculata for many years and love the IHM sisters. Both Sisters could teach teachers now. After having a class of 85 students, this should qualify them for many positions in education. I am a product of St. Cyril’s and can vouch for the quality education I received in such a large class. Sr. Kevin Maureen (1st), Sr. Herman Joseph (5th), Sr. Anastasia (6th). [Miss Cera (2nd & 3rd) Mrs. Bouchard(4th) ]. I can never do enough to attempt to repay my I.H.M. Sisters. A beautiful story, thank you for sharing, Carmel. The sisters of the Immaculate Heart of Mary order are the greatest educators. Thank you for a great education & preparing us for our sacraments. God bless you all. Congratulations to the O’Brien sisters’ anniversary. Hi Kathleen. I spoke to my aunts and they are open to an interview. Thank you for your lovely comment. They are both a true gift ! Let me know the best way to facilitate. I remember both sisters being at St. Cyril’s when I was in first grade. All the students loved them. Sister Regina Christine swallowed one of her veil pins and we all prayed for her recovery. They are both Angels! Kathleen, Perhaps you know Jack and Pat O’Brien, stalwart pro-life advocates. They are Jack O’Brien’s sisters. We are so blessed to see them often with Jack and Pat. JOY radiates from them. I had 2 cousins who were sisters and Mac nuns back aways. Sister Rita Edward Sheridan and Sister Rita Immaculata Sheridan. My husband and I had the pleasure of traveling with these great nuns. They were great companions on the Archdiocese Pilgimage to Fatima and Lourdes this summer. Can’t imagine teaching 87 first graders!!! Great story! These 2 sisters almost always go to 1st Saturday Pro Life Mass at St. Agnes, West Chester, then pray together at Planned Parenthood, West Chester, then return for their brother Jack O’Brien to lead a pro-life meeting with coffee and donuts. Amazing servants of Christ. What a Beautiful story! I would love to interview both sisters. My name is Kathleen McCarthy, I am the President of , In His Sign Catholic Radio, in Rosemont, Pa. I think I know Sr. Regina Christine. Was she ever at a House of Prayer in the summer at St Kohn of The Cross in Roslyn? Pa. Or perhaps teach there? God bless both of you !